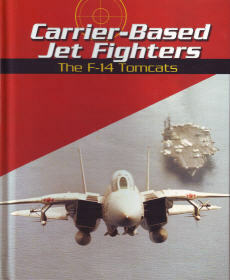 This children's book provides an overview of the carrier based F-14 Tomcat aircraft along with its mission, history, recent conflicts, and modern equipment in Naval Aviation. Carrier Based Jet Fighters book: Reading Level: Ages 4-8, 32 pgs, hardbound w/Library Binding. TOP QUALITY.